Last month, scientists, conservationists, and the ecotourism industry alike were all disappointed when the National Marine Fisheries Service (NMFS) determined that the great hammerhead shark will not be listed under the Endangered Species Act (ESA). NMFS also decided against listing scalloped hammerhead sharks in the U.S. last year, a motion that was finalized this month. Despite notable evidence of the severe decline of both species in recent decades and their extreme vulnerability to being captured as bycatch, NMFS cited that there was not enough data on population trends in order for them to mandate a listing for either species. Great hammerhead sharks are the largest of the hammerhead shark species, reaching nearly 20 feet in length, and they're also some of the longest-lived sharks. Because they give birth to few young and have very sensitive bodies, they are extremely vulnerable to human exploitation. In fact, the International Union for Conservation of Nature (IUCN) classified the great hammerhead shark as endangered in 2007. There are multiple populations of this species living around the world, including the northwest Atlantic population in U.S. waters-estimated to have declined by as much as 90 percent during the past century, mainly as bycatch in bottom longlines and other net fisheries. NMFS's decision not to list the great hammerhead came after a 12-month review process as a response to multiple petitions from conservation groups asking for the shark to be listed as threatened or endangered under the ESA. The petitions alternatively asked for any "distinct population segments" to be listed, specifically the northwest Atlantic population. Unfortunately, however, NMFS concluded that the species does not warrant ESA listing, as they believe it "is not currently in danger of extinction throughout all or a significant portion of its range and is not likely to become so within the foreseeable future." In 2013, NMFS also decided against listing the two populations of scalloped hammerhead sharks that reside in U.S. waters, a decision that was finalized this month. Although they decided to list the four other populations as threatened or endangered, they have left out the two that reside around Hawaii and in Atlantic waters, allowing for targeted fishing to continue. The dramatic decline in these species has shown that existing management measures are not enough to ensure that they will recover. 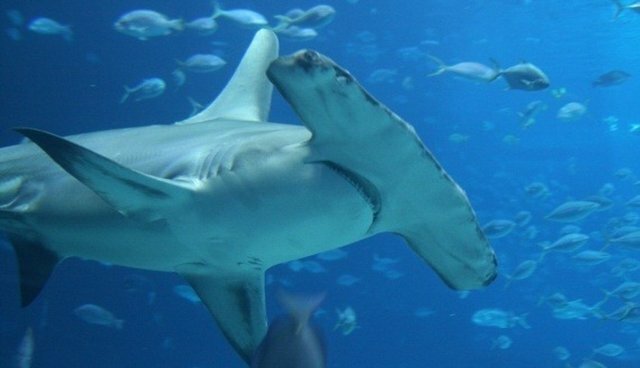 The U.S. lacks strong regulations to protect hammerheads from continued exploitation and further decline. Once hooked and released, very few of these sharks survive, and more importantly, there is no limit to the amount of hammerhead sharks that can be killed. If great hammerhead sharks and scalloped hammerhead sharks were granted protection under the ESA, the government would be required to minimize the impacts of human activities that harm these sharks, including requiring gear changes or setting enforceable bycatch limits. These protections would help turn the tide for hammerheads and allow populations to rebuild in the face of continued threats from overfishing and bycatch. The failure of NMFS to provide protections for the great hammerhead shark and the scalloped hammerhead shark is a tremendous step backwards. The U.S. should act as a leader in the global shark conservation effort, instead of waiting to act until it is too late. Because sharks play an important role in marine ecosystems as key predators and indicators of ocean health, their recovery is vital to maintaining the health of marine ecosystems around the world and in the U.S.